Several months after the iPad Air 2 hit shelves, form-fitting cases still remain few and far between, and even our favorite case makers have been rushing out “quick fix” options reusing most of earlier, thicker iPad Air 1 designs. 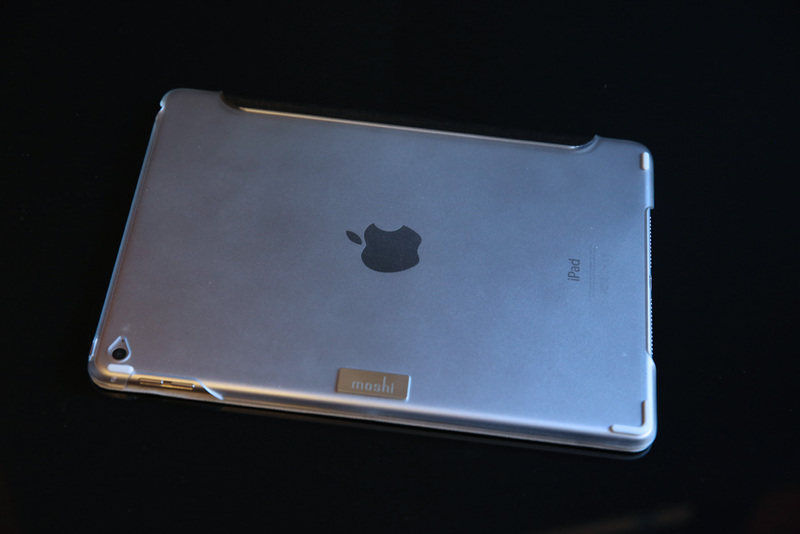 Moshi’s VersaCover for iPad Air 2 ($60) is different. 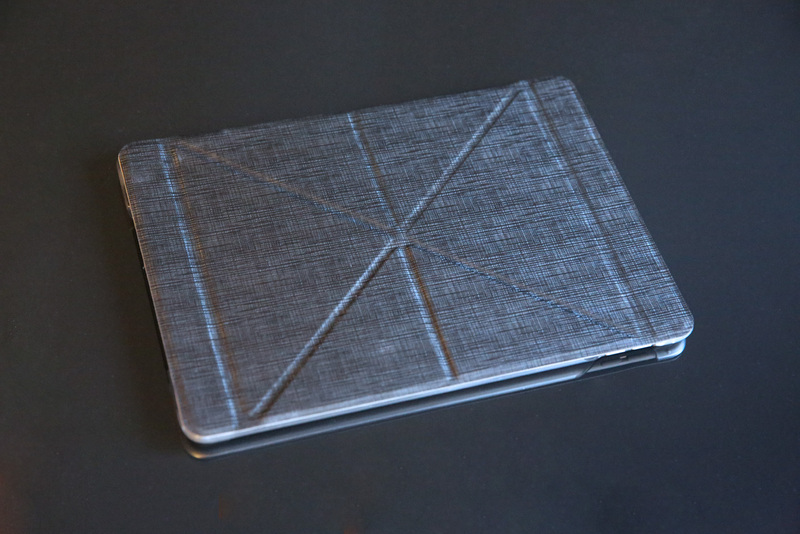 While the “origami cover” front lid is identical to one that was used in the same-named iPad Air 1 case, the rear shell has been redesigned to precisely fit the more slender iPad Air 2’s form. If you’re looking for a super-thin iPad folio with mature textures, colors, and stand functionality, it’s worth considering. 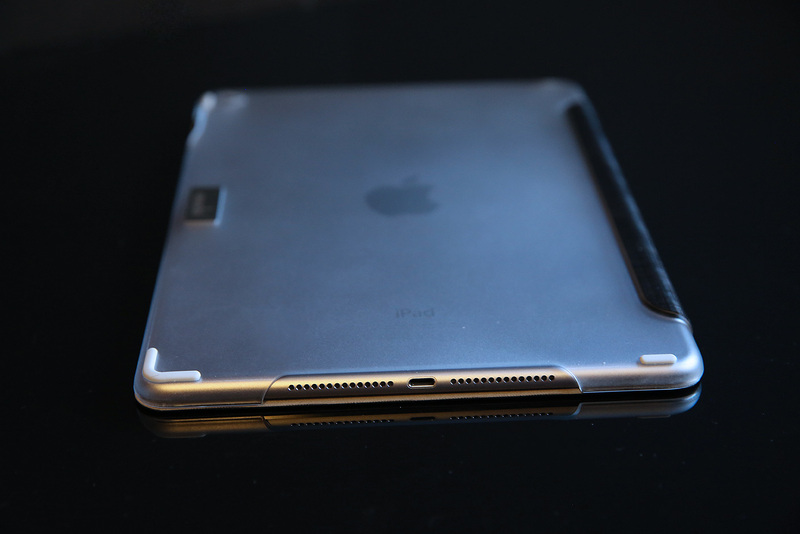 Super-slender iPad Air 2 case adds only 1-2mm per side of thickness. Tan, pink, blue, and black versions available, each with fabric lid, clear frosted back. No side or top button coverage. Large holes on side and bottom for buttons, speakers, Lightning. VersaCover is a one-piece case assembled from two non-detachable parts: a fabric-covered magnetic folding lid and a hard plastic rear shell. Unlike Apple’s iPad Air Smart Covers and Smart Cases, which segment into three bars that fold into triangular stands, the lid uses six triangles and two bars to create pyramid-like video and typing supports. Tiny magnets can lock and unlock the iPad’s screen, as well as hold the lid on the shell’s back when it’s not in use. One intuitive, easy lid position to accomplish places the iPad Air 2 on a gentle video-friendly recline; the same configuration lets you turn the iPad into portrait orientation for FaceTime calls. Somewhat less intuitive positions enable 45-degree and shallower landscape typing orientations, though you’ll likely spend a little time scratching your head looking at Moshi diagrams trying to figure them out. The lid positions are stable enough to support the iPad Air 2 even when hands are frequently interacting with the screen. Moshi’s rear shell is good, but not perfect. On a positive note, it’s so precisely fit to the iPad Air 2 that the side microphone hole is barely larger than the top of a pin, and there are unusual little rubber feet to keep the frosted plastic and Moshi metal name-badged rear from scuffing on a table. Ports are open, the buttons, speakers, camera and microphone are accessible, and the shell looks nice. The only major problem: VersaCover’s side button and bottom speaker openings have sharp edges that really should have been polished a little. Rubbing your fingers against them intentionally or accidentally doesn’t feel great. If we had to choose between Apple’s iPad Air 2 Smart Case or VersaCover, the choice wouldn’t be hard: we’d go with VersaCover because of the more reasonable pricing, the slimmer tailoring to the iPad Air 2’s body, and the added versatility of its lid. But VersaCover does look less expensive thanks to its fabric and plastic materials. If you prefer fancier leather and don’t mind the extra bulk, Apple’s design is more handsome, softer, and more protective at a higher price. Both are good cases; your iPad case budget will likely be the best determinant of which is right for your personal needs.